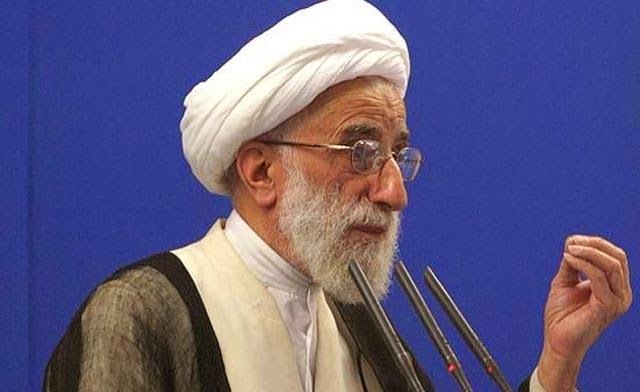 Ayatollah Ahmad Jannati, the chairman of Iran’s powerful Guardian Council, told a crowd at Friday’s Prayer in Tehran that some Iranian officials are attempting to establish secret relations with the United States. But Jannati singled out Iran’s nuclear negotiators and warned them not to enter into negotiations with the United States outside nuclear issue. That Jannati is a liar. The "underground network" was Mojtaba who was sent to the US with a begging bowl before 2013 presidential selections to secretly negotiate Islamic regimes capitulation to western demands.Nothing must be taken at face value with these criminals. Not related to the topic but an interesting video that shows how the Iranian border guards were taken prisoner by Jeish Ul Adl. As one can see...the terrorist's success was entirely due to the laxity and poor readiness of the Iranian border guards. One can only hope that such poor discipline isn't common in the other segments of the Iranian army, but it might be too much to hope for. As history has proven...poor readiness and lack of discipline is all too common in Middle Eastern (Arab armies) ...Iran is apparently not any different to other Arab armies in that regard. Now compare and contrast what happened in this videoclip to situations facing the US Army or Marine Corps. It's hard to imagine that a few militants would be able to just walk in and arrest just a lone US army soldier or a Marine, let alone a squad. Anon 9:14 PM......Saw the film and I was shocked by these border guards lack of preparation. Who the hell trained these men? They should have had two men on watch duty while the others on rest and so on. The five border guards were caught knapping in their tent by three terrorists. "Iran is apparently not any different to other Arab armies"! Really? With that, you destroyed any credibility you may have had. "It's hard to imagine that a few militants would be able to just walk in and arrest just a lone US army soldier or a Marine, let alone a squad." Oh really? You must not have heard about the case of Private First Class Kristian Menchaca and Private First Class Thomas L. Tucker of the US Army, who were captured and killed in Iraq, in 2006. You probably also have not heard of the cases of Ahmed Kousay al-Taie; Keith Matthew Maupin; Brian Freeman, Jacob Fritz, Jonathan Chism and Shawn Falter; Alex Ramon Jimenez, Joseph John Anzack and Byron Wayne Fouty; all of whom were US Army soldiers who were also captured and killed, in Iraq. How about the case of Bowe Bergdahl, another soldier of the US Army who was captured in Afghanistan and is currently being held as a prisoner of war? 9:14, those Iranians are prisoners under an oppressive regime. It takes all the courage they have not to kill themselves every morning never mind being prepared for an ambush. That's why it's such an unspeakably evil thing for Iranians living comfortably in the west to lie about and organize the regime. If Pakistan can punish militants using its airforce then why cant Iran? Anonymous February 21, 2014 at 9:14 PM, has no more expert opinion to offer!